Carnival rides, games, food sales and live music will be on tap when Penn Manor High School hosts Spring Fling from 3 to 9:30 p.m. Friday, May 9. The event, which generates funds for PMHS student groups, will be held at the Comet Field complex. Among the activities planned are a volleyball tournament, bean bag toss, soccer kicking contest, “ag olympics” and a car-bashing event, all sponsored by student organizations. In addition, students will be selling Italian ice, Smoothies, chicken barbecue, french fries, ice cream, Dutch pretzels and other foods. The carnival rides are being provided by outside businesses, along with an inflatable “bounce house,” a sumo wrestling ring, games and food. Penn Manor students will be performing live music throughout the day. The evening will end with a fireworks display at 9 p.m. Admission is free, but there is a charge for food, carnival rides and games. Come on out and support our student groups! 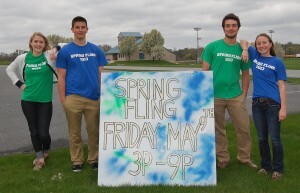 Spring Fling organizers, from left, Alisa Herr, Brad Seiger, Nick Kirk and Hannah Willig, pose with a sign for the event at Comet Field.